Will this single serve cup work with all Keurig® coffee brewers? No, this cup is not compatible with the Keurig® Plus Series and Keurig® 2.0 brewers. Make sure to read the user manual of your single serve coffee brewer for specific compatibility information. 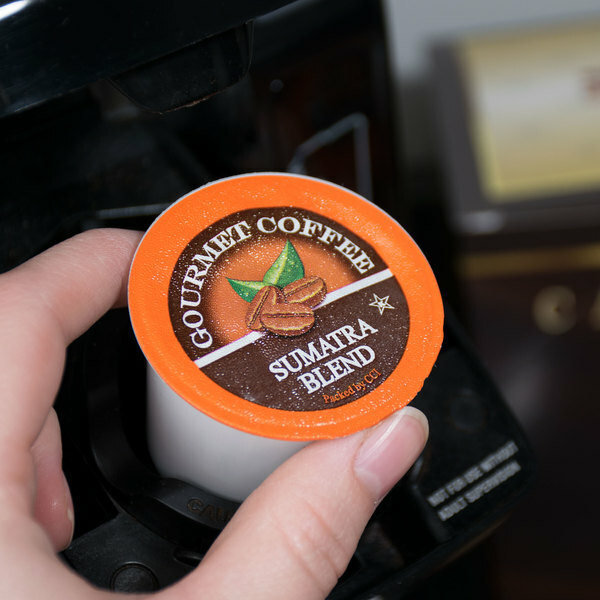 Offer the fresh, bold flavor of decadent, barista-style beverages without all of the time and effort with these Caffe de Aroma Sumatra single serve cups! Rich and dark, this roast offers a uniquely rustic, earthy flavor profile. The coffee's herbal nuances and low acidity make this blend a popular addition to your specialty coffee selection! Single serve beverage cups are becoming more popular due to their many advantages. They bring convenience and consistency to any beverage service. Great for your break room, cafeteria, office, hotel breakfast buffet, or other area with a self-serve beverage station, these single serve cups make it easy for anyone to brew a coffee shop-style beverage. 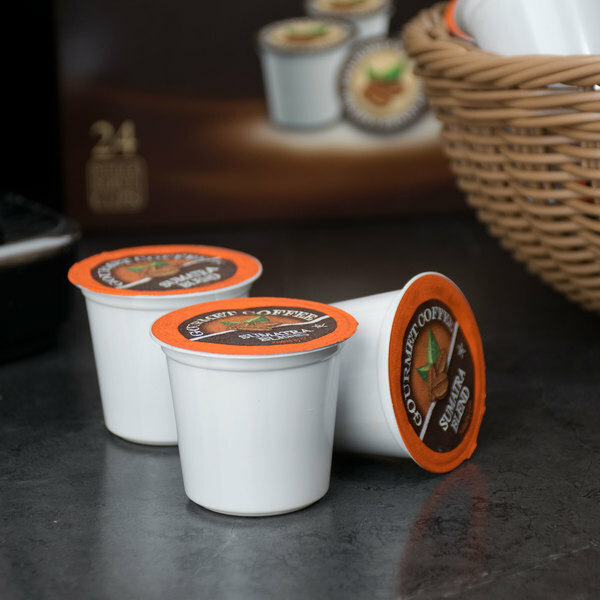 Designed for use in select Keurig®, K-Cup®, and single serve coffee makers, these beverage cups can produce your customers' favorite specialty and flavored beverages at the touch of a button! Simply follow the instructions on your machine to properly prepare. 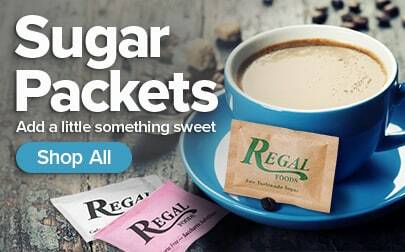 Each single serve portion offers consistently delicious coffee without hassle. 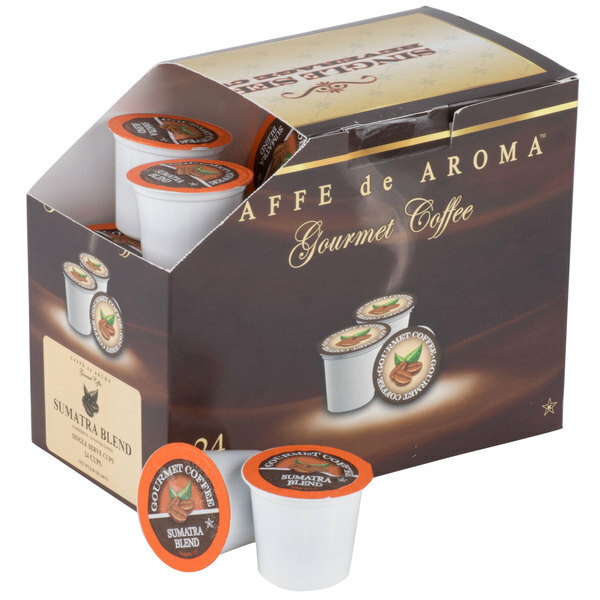 Ensure that every cup of coffee you brew tastes its best, and stock your restaurant, coffee shop, or other venue with these Caffe de Aroma Sumatra blend single serve coffee cups! Even though this coffee is on the strong side, it still tastes great and doesn't leave a bad aftertaste in your mouth. The price is excellent. I would recommend it. This is one of my favorite cups coffees to make. The aroma is just so good it makes my whole apartment smell amazing. Packaged 24 single serve cups per box. The Caffe de Aroma Sumatra blend is a bold and dark themed coffee that is great for an afternoon pick me up. The coffee smells amazing brewing and the single serve cups are a really nice quality. So much better than what I can get in the store. This is a really good coffee. It's not quite as dark as I was hoping, but it has a rich flavor and is extremely smooth. These K-cups are compatible with the Hamilton Beach 49995 FlexBrew Single Serving Coffee Maker. The only downside is the inside of the box, and the outside of the plastic on the K-cups appear dirty. I think the foil rubbed off on to the plastic, as they were all just jumbled up inside the boxes. At first i just noticed the good price on k cups. But when i tried the coffees that webstaurant was selling i was blown away at how good they are. 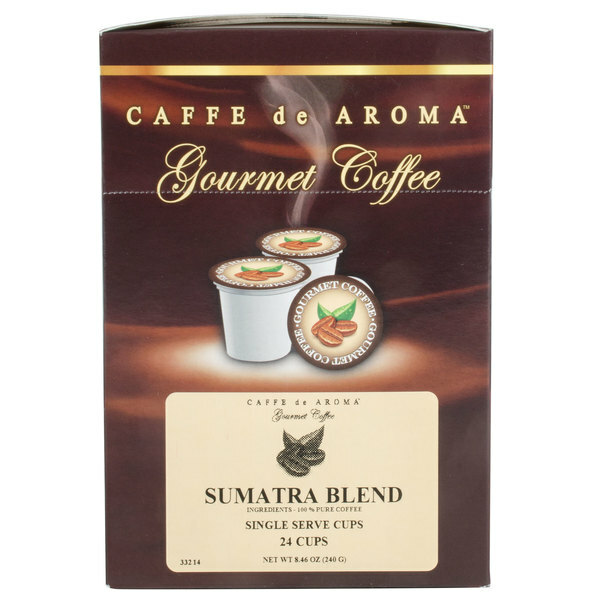 Caffe de Aroma Sumatra Blend Coffee Single Serve Cups - 24/Box #110KC64024 is exotic, robust yet smooth. Its my personal favorite along with midnight silk. They're great blended together! This coffee is great. The Small size makes storang easy. The aroma And flavor is amazing as well. I suggest this coffee to anyone who likes caffeine. 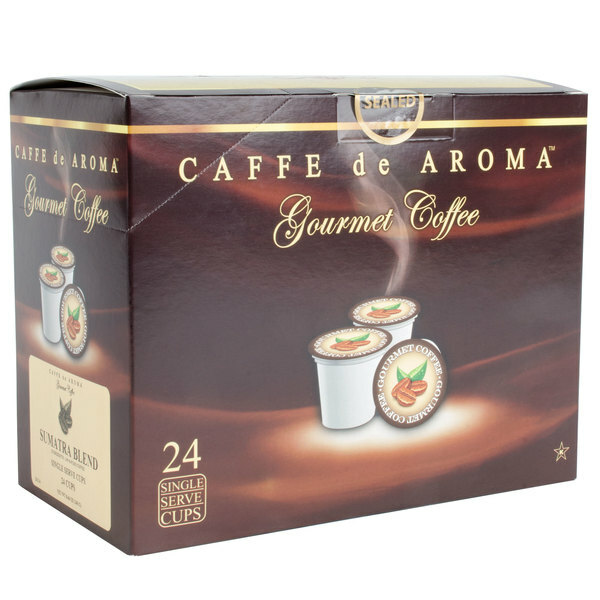 Sir Clean recommended this product Caffe de Aroma Sumatra Blend Coffee Single Serve Cups - 24/Box, we like how taste this coffe, also the sweet aroma. A great coffee indeed. Of the different coffees that I tried from this company I would say this was the best one of the bunch. This blend was a tad more expensive that several others we bought and tried. I don't find the bold flavor I expected from a darker roast that was priced a bit higher. Would stick to the cheaper ones. If I wasn't comparing it against the other flavors for price, it would have gotten 4 stars on flavor alone, but I give it 3 because I can't justify the higher price. Want to serve an exceptional coffee with little or no fuss at a competitive price? Then I strongly recommend these Sumatra pods. 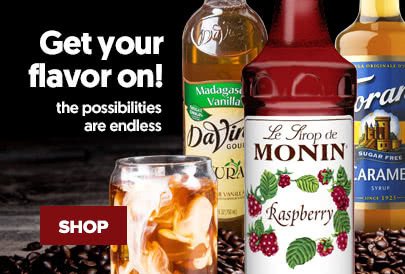 A better flavored cup of coffee you will not find anywhere! Cafe de aroma Sumatra Blend coffee is a delicious and sweet smelling drink. The aroma is enjoyable and the taste of the coffee is not too sweet and just right. Will buy again. These pods are good but not great. Based on other reviews I was hoping they were a little better but overall I'm happy with them. They taste good I was just expecting more. I have bought A LOT of this brand of coffee from Webstuarant because everyone loves it! I don't buy from the box stores anymore. I keep five varieties on hand and everyone keeps trying them all! I ordered double the amount this time and will keep ordering this brand because everyone is enjoying it. As expensive as K-Cups are and the cost of not only these, but the other flavors for 24 cups is not bad. I expected stale not so good coffee out of the box, but mixed with a little milk you cant tell much of a difference between these and other brands. We will definitely buy more in the future.